As mentioned in part one of our series, there are a variety of options engineers might consider when specifying a solution for a primary or secondary application. I also listed several advantages of both concrete and reinforced flexible membrane liners (rFMLs) in the last post. Below, you’ll find three additional benefits seen with rFMLs in primary and secondary containment applications. Reinforced flexible membrane liners provide solutions which overcome the challenges presented by concrete in containment applications. rFMLs are relatively thin sheets of flexible thermoplastic polymeric materials reinforced with high-tenacity fabric. There are a variety of polymers used in the manufacture of rFMLs (Figure 1) each with a variety of performance characteristics which provide an array of options for use on a site-by-site basis. A brief description of each is included in Figure 1.
rFMLs provide much better service in regard to temperature extremes. This is due to the fact rFMLs are flexible and demonstrate great dimensional stability in both hot and cold environments. 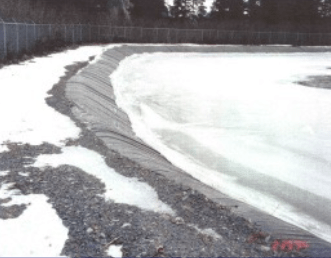 Freeze/thaw (also known as frost/heave) dynamics have little effect on geomembranes. Examples of success can be seen in both very cold climates and very hot climates. Picture 1 shows a rFML being used on a National Science Institute facility in Antarctica. The Lowell Point Wastewater Treatment Plant in Seward, Alaska is another example of an rFML being used in cold weather. In this case, a liner is used for an aerated sewage lagoon application (Pictures 2a and 2b). 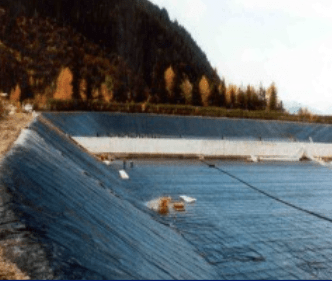 Installed in 1991, the liner on this project continues to perform well to this day. rFMLs have also been used in very hot, UV-intense environments. 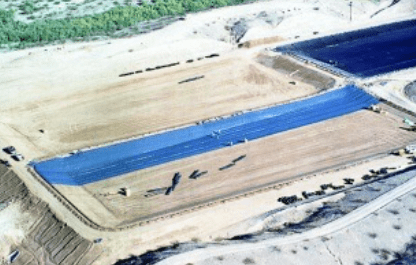 Southern California Gas installed a liner for the evaporation ponds at their Mohave Desert facility (Picture 3). These lagoons were constructed in 1991 and saw service until the plant was decommissioned in 2006. The original liners provided reliable service for the life of project. 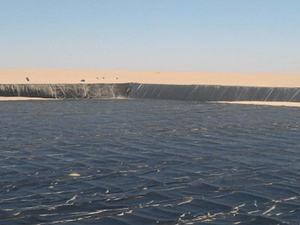 In another heat and UV-intense application, RAI Oil Field Services (an Oil & Gas firm based in UAE) chose a rFML for its use in creating an oily water lagoon for a tank farm in Libya (Picture 4). The ability to fabricate very large panels of material helped the construction process in two ways. First, by making it faster to deploy the material once shipped to the remote site. and secondly, by reducing the number of field seams required on the site. This again sped installation and reduced the time and number of welding crews required on the job site. 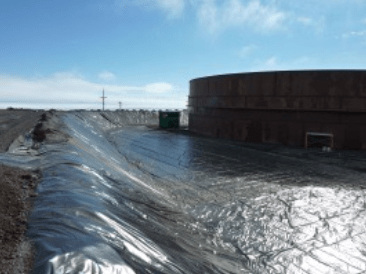 Overall, reinforced flexible membrane liners are superior over concrete when it comes to primary and secondary containment applications. Not only will projects reap the benefits of quicker deployment, but these projects will also be exposed to improved chemical and extreme temperature resistance. What other advantages do geomembranes possess over concrete? Share your thoughts in the comments.